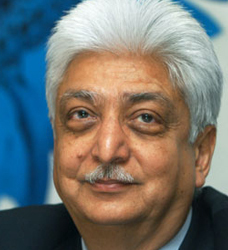 Azim Hasham Premji, founder of Wipro Limited, India's biggest and most competitive IT company based in Bangalore, was born on July 24th 1945 in Bombay. Premji was forced to leave his studies in computer science from Stanford University, California, USA at the age of 21 to take over the family business of vegetable oils when his father M.H. Premji, suddenly passed away in 1966. He has since after a gap of over thirty years completed his degree in Electrical Engineering. The Amalner-based vanaspathi manufacturing company, the Western India Vegetable Product later became Wipro Products Ltd, Wipro Technologies and Wipro Corporation. Under Premji's leadership Wipro embarked on an ambitious phase of expansion and diversification. The Company began manufacturing light bulbs with General Electric and other consumer products including soaps, baby care products, shampoos, powder etc. In 1975, Wipro Fluid Power business unit manufacturing hydraulic cylindersand truck tippers was started. But Premji's ambitions did not stop there. In the 1980s Wipro entered the IT field, taking advantage of the expulsion of IBM from the Indian market in 1975. Thus, Wipro became involved in manufacturing computer hardware, software development and related items, under a special license from Sentinel. As a result, the $1.5 million company in hydrogenated cooking fats grew within a few years to a $662 million diversified, integrated corporation in services, medical systems, technology products and consumer items with offices worldwide. The company's IT division became the world’s first to win SEI CMM level 5 and PCMM Level 5 (People Capability Maturity Model) certification, the latest in quality standards. A large percentage of the company's revenues are generated by the IT division. Wipro works with leading global companies, such as Alcatel, Nokia, Cisco and Nortel and has a joint venture in Medical Systems with General Electric company. Premji's story of success and prominence clearly shows how determination and perseverance, when coupled with knowledge, clear vision and proper planning, enable one to reach the peak of success and leadership. A straight forward person, he doesn't believe in resorting to bribery or corruption to get things done and associates quality with integrity. He is an absolute workaholic and according to him work is the only way to success and survival in a competitive environment. A tough employer, he expects his employees to be competent and will not tolerate lies or deception from anyone. Azim Hasham Premji finds himself in the Forbes Billionaire List 2000, placed in 41st position with a wealth of $ 6.4 billion. Over the years, Azim Premji has been privileged with many honors and accolades. He was chosen as the Business India's 'Businessman of the Year 2000', He was named by Fortune (August 2003) as one of the 25 most powerful business leaders outside the US, Forbes (March 2003) listed him as one of ten people globally, Business Week featured (October 2003) him on their cover with the sobriquet 'India's tech king'. The Indian Institute of Technology, Roorkee and the Manipal Academy of Higher Education have both conferred honorary doctorates on him. He is also a member of the Prime Minister's Advisory Committee for Information Technology in India. In the year 2001, Premji established Azim Premji Foundation, a not-for-profit organization with a vision of influencing the lives of millions of children in India by facilitating the universalisation of elementary education. The foundation works closely with the state governments of Karnataka, Andhra Pradesh, Madhya Pradesh etc and the programs cover over 5000 rural schools. Premji contributes the financial resources for the foundation. Personally, Premji is known for his humility and helping mentality. Easily one of the richest men in the world, he always travels in economy class. One of his favorite recreational activity is hiking. He leads a quiet life with his wife Yasmin Premji who had worked for 'Inside Outside' (editorial) in Mumbai and his two sons in a simple, but elegant villa in Bangalore. The elder son, Rishad, works in the USA for GE and the younger one, Tariq, has co-founded a dotcom and works from Bangalore. Mr. Premji who holds 78% stakes in the company does not believe in naming one of his sons as his successor just for the norms.